A Russian space capsule carrying a package of biological and materials research specimens, including geckos and plant seeds, has stopped responding to commands from Earth, the Russian space agency announced Thursday. The Foton M4 spacecraft launched July 18 on a two-month mission with 22 Russian and German experiments to study how animals, plants, microbes and next-generation manufacturing materials react to spaceflight. The spacecraft stopped responding to commands from mission control after a few orbits, according to a joint statement released Thursday by the Russian Federal Space Agency and TsSKB Progress, manufacturer of the Foton capsule. Telemetry streaming from the satellite to the ground is not affected by the problem, officials said. The capsule's systems are all operating normally, and the design of the Foton M4 spacecraft allows for long-term autonomous operations without input from ground controllers, according to the joint statement. Experts are working to restore two-way communications with the spacecraft, according to Russian space officials. The capsule was supposed to fire its on-board propulsion system to boost its altitude shortly after the July 18 launch, but the burn never occurred. The maneuver would have put the Foton M4 spacecraft in a circular orbit about 575 kilometers, or 357 miles, above Earth. Radar tracking data from the U.S. Air Force indicates the spacecraft is in an elliptical orbit with a low point of about 250 kilometers, or 155 miles, where it was deployed by a Soyuz launcher after liftoff from the Baikonur Cosmodrome in Kazakhstan. It was not clear how long the Foton spacecraft could remain at such an altitude, where drag from the Earth's upper atmosphere is strong enough to make objects fall from orbit. The Foton M4 capsule was scheduled to return to Earth in mid-September with a guided re-entry and parachute-assisted landing in southern Russia. Roscosmos also did not say whether the spacecraft could land normally without commands from the ground. The landing module is fitted with a heat shield and is designed to survive re-entry. The pressurized section of the Russian-made spacecraft houses geckos in a habitat to supply the animals with food and air to breathe. Researchers planned to monitor the effects of microgravity on the adult geckos, including their sexual behavior and embryonic development, according to Roscosmos. 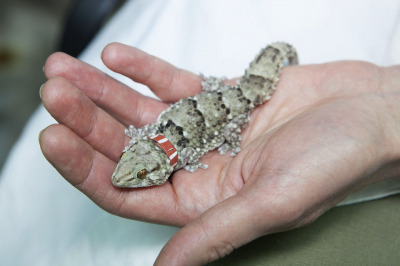 Scientists expected to have a continuous video recording of the gecko habitat aboard the spacecraft. Scientists planned to study dried seeds and silkworm eggs inside the Foton space capsule to determine their response to cosmic radiation, and the satellite carries several experiments for research into microbes. The mission is the 16th flight of a recoverable Foton spacecraft since 1985. The Foton M4 mission marks the introduction of several upgrades to extend the duration of the flight, including solar panels to generate electricity and a new propulsion module to adjust its orbit. 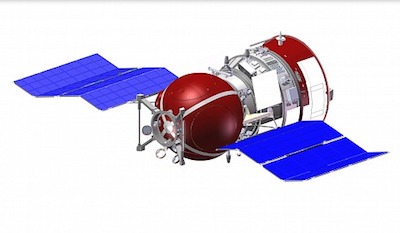 According to information posted on the Roscosmos website, the Foton M4 spacecraft is packed with nearly 1,900 pounds of research hardware inside and outside the capsule. A joint Russian-German experiment inside the capsule is designed to measure the growth of semiconductor crystals in microgravity, an investigation scientists hope will lead to advancements in solar cells, light emitting diodes, transistors and other applications in the electronics industry. "The goal is to produce crystals with the highest possible quality," said a statement by DLR, the German space agency. Three types of materials were to be heated up inside a Russian-made furnace housed inside the Foton M4 spacecraft. Once melted, the samples will crystallize as scientists study the influence of magnetic fields and vibrations on their growth. Preflight plans called for the samples be divided among Russian and German scientists at the end of the mission.